Article on Forbes: Micro-Influencers – the Marketing Force of the Future? 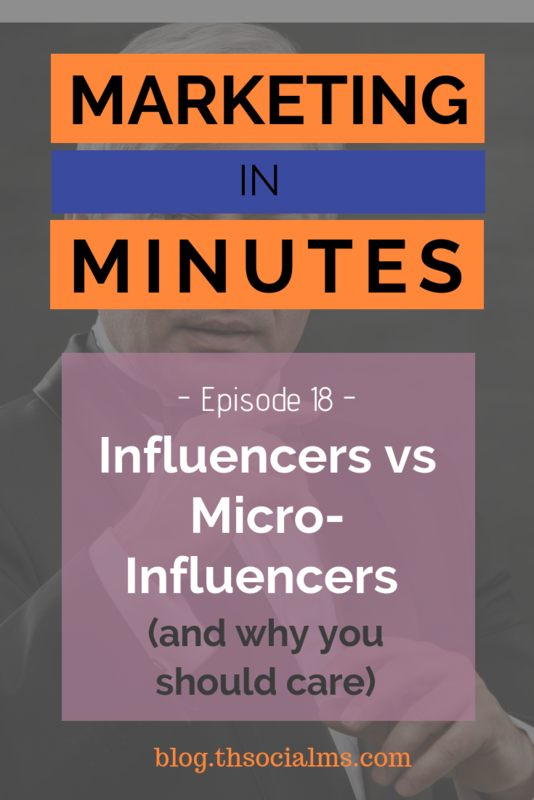 Episode 18: Influencers vs Micro-Influencers in Marketing – and why you need to know! Influencer marketing has been a hot topic in marketing for the last couple of years. But influencer marketing is nothing new. And influencers aren’t new either. But something else is: micro-influencers… and their importance for marketing. I’m Jonathan Gebauer and you are listening to Marketing in Minutes. Welcome to Marketing in Minutes by The Social Ms, the podcast that gives you all you need to know about one marketing topic per episode in under 10 minutes. I’m your host Jonathan Gebauer, and today, let’s talk about micro-influencers and what you need to know about them! With the rise of social media, social media marketing, and social media influencers, came the rise of influencer marketing. For the last couple of years, influencer marketing was everywhere. But influencer marketing wasn’t new when social media showed up. Here is an early example of influencer marketing for you and how it worked in a world without social media. During the 60s and early 70s, Puma and Adidas were fighting a war… The sneaker war. The fight showed mostly in who could sign which athlete to wear their sports shoes. This fight led to strange events like Adidas getting Puma shoes confiscated at the 68 summer Olympics. Athletes began to notice what was going on and played the two companies against each other – which made the war between them a financial disaster for both. So they decided to do something about it and for the 1970 world cup, they had some kind of loose peace treaty: They agreed that no company would sign a deal with the most well-known and best football player of that time: Pele. But then, right before the final match of the world cup, Pele walked to the center of the pitch, kneeled, and tied his shoelaces in full view of the cameras. And revealed his Puma sneakers. Pele himself had been unaware of the deal and was wondering why he was the only player who couldn’t get a deal with either Adidas or Puma. So he approached Puma on his own. And Puma went for it. Just in time for the final, Puma went behind Adidas’ back and the peace between the rival companies was over. This is more then just an early example of influencer marketing. Both companies had been fighting an influencer battle for a long time. And in a perfectly timed moment, Puma managed to take influencer marketing one step further. And while influencer marketing developed a lot since then, this was probably one of the defining moments for this marketing strategy. People who we would call influencers existed long before social media. They were the people we listened to on radio talk shows, who we watched at sports events, who appeared on TV, and who we followed in newspapers. And they were often used for marketing – for instance appearing in TV ads highlighting the clean shave they got from that brand new razor. But using influencers as a marketing tactic was expensive. There were few influencers that were adored by as many people as today, and influencers at that time didn’t have a direct communication channel to their fans. So influencer marketing was a relatively small area of marketing. Social Media changed that. With the invention of social media came the rise of social media influencers. It gave existing influencers a communication channel that allowed them to directly communicate with their fans. It allowed for the rise of new influencers – influencers who got popular purely through the use of social media. And in return, the prices for influencer marketing dropped – while the return on investment for influencer marketing rose to extreme heights. But social media isn’t without its own problems. Some so-called influencers only grew their so-called audience by buying followers. Real influencers discovered how much they could charge for their services. And celebrities and real-world influencers discovered that they could rise to absolute super-star status through using social media. The most recent and impressive example of this is Kylie Jenner from the Kardashian clan, who at the age of 21 made her first billion Dollars. All by marketing her own cosmetics and fashion products through her social media presence. As a result, the prices for influencer marketing have again gone way up. And marketing pros, brands and executives are looking for alternatives. And that’s where Micro-influencers come in. A micro-influencer is someone with a considerable following in social media. Not big enough to be called an influencer, but big enough to make a small impact. Someone with a following that reaches beyond their real-world circle of friends. As a single person, their influence isn’t big enough to have a huge marketing impact. But as a group, their influence is massive. And brands are currently discovering the value of micro-influencers for their marketing. But what is the value of micro-influencers? First, they are cheap – and they are actually grateful about brands for working with them. For the price of working together once with a huge celebrity influencer, brands today can run micro-influencer campaigns on a massive scale. Second, when working with micro-influencers you have better control over targeting. If you work with 100 micro-influencers on Instagram, each with a following of around a thousand people, you can look at each of their accounts and select a total audience that fits your needs. When you work with one influencer who has 100k followers, it’s take it or leave it. And third, micro-influencer campaigns can also be run using different marketing tactics – you can for instance engage with them through events, you can engage them through competitions, and so on. And yes, you can still engage micro-influencers by simply talking to them on social media. With huge influencers like Kylie Jenner, you don’t even have to try! But why do YOU need to know about micro-influencers? You need to know because: Micro-influencers aren’t just a great opportunity for big brands – they can also be a great opportunity for you. Micro-influencers are not like influencers – they aren’t exactly famous, but they are willing to grow their audience and their influence. As a result, their interest isn’t solely money. Quite the contrary – they are willing to cooperate, to work with you, and even if you want to offer them money, or a product, they will be far more willing to work with you instead of just taking your money and fulfilling a contract. And you can take part in the social media influence game of cross-promoting each others accounts. And what’s great about this is: All of these tactics don’t require a budget at all. The more influential influencers get on social media, the less approachable they become. That’s why for small brands micro-influencers are right now a massive opportunity. That’s all for this episode – I hope you like this podcast! If you do, please subscribe and share it with your network! And if you can find the time please leave a review on Apple podcasts or wherever you listen to podcasts. It really helps others find out about the show! For more information about today’s topics, please take a look at the show notes of this episode which you can find at blog.thesocialms.com/MiM-18. 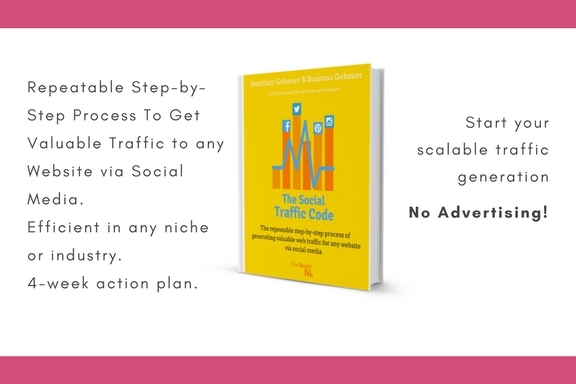 And for a full-scale marketing strategy that you follow step-by-step for your blog or business and get traffic, leads, and sales – please take a look at our book, The Social Traffic Code. I’m Jonathan Gebauer and you’ve been listening to Marketing in Minutes. That’s all I have for you today – take care, bye!